We’d love your help. Let us know what’s wrong with this preview of No Longer Whispering to Power by Thandeka Gqubule. Advocate Thuli Madonsela has achieved in her seven years as Public Protector what few accomplish in a lifetime; her legacy and contribution cannot be over-stated. In her final days in office she compiled the explosive State Capture report and, before that, the report on President Jacob Zuma's Nkandla residence. Praised and vilified in equal measures, Madonsela has frequent Advocate Thuli Madonsela has achieved in her seven years as Public Protector what few accomplish in a lifetime; her legacy and contribution cannot be over-stated. In her final days in office she compiled the explosive State Capture report and, before that, the report on President Jacob Zuma's Nkandla residence. Praised and vilified in equal measures, Madonsela has frequently found herself at centre stage in the increasingly fractious South African political scene. Yet, despite the intense media scrutiny, Madonsela remains something of an enigma. Who is this soft-spoken woman who stood up to state corruption? Where did she develop her views and resolve? This book attempts to answer these questions, and others, by exploring many aspects of Madonsela's life: her childhood years and family, her involvement in student politics, her contribution to the constitution, her life in law. Madonsela once described her role as Public Protector as being akin to that of the Venda traditional spiritual female leader, the Makhadzi, who whispers truth to the ruler. When the sounds of the exchanges between the ruler and the Makhadzi grow loud, Madonsela said, that is when the whispering has failed. To ask other readers questions about No Longer Whispering to Power, please sign up. Probably the one book you should read if you've given up on believing in the dream that all freedom fighters had for South Africa. Thuli Madonsela's story is a testimony to her indomitable will, her quiet strength and her belief in making South Africa a country that holds its leaders accountable for their actions. In an interview with the author of this book, I've called Thuli a rebel, makhadzi and fearless in the face of government resistance - and having read this, I stand by my stance even mo Probably the one book you should read if you've given up on believing in the dream that all freedom fighters had for South Africa. Thuli Madonsela's story is a testimony to her indomitable will, her quiet strength and her belief in making South Africa a country that holds its leaders accountable for their actions. Great book for every South African to read. Great narration of our past struggles as a black nation and how all of this has gone to vain because of power, politics, hunger and greed. Eish. Someone making money out of us gulible people. And gulible we are. Buying a book with Thuli's photo on the cover thinking we are going to be enlightened. But alas. Just the cover shoud have put me of. Michiel Botha chose a very unflattering photo. of useless information and repetition galore. Clearly no proofreading was done. Just put out a cover with Thuli's photo and we gulible people will buy it. Now 2 reviewers has said a must rea Eish. Someone making money out of us gulible people. And gulible we are. Buying a book with Thuli's photo on the cover thinking we are going to be enlightened. But alas. Picked this book up from Joburg airport without high expectations. As foreigner I had never heard of Madonsela and my knowledge on the South African political scene was fairly limited too. That being said, I found this book an excellent read. Easy to follow, well built up. Not to mention Madonsela's story is a true inspiration to any young professional. Very interesting angle in telling Thuli’s story. At first I had no idea how political active she has been in her youth. I guess it’s the pre-democracy life of any black South African to be always caught in the mix of politics . Seemed her and her brother found politics the only way to make a difference in their communities . Pretty fascinating was her rose to the top office . There, she assumed the role of a real people protector with vigor. It was quite clearly that her involvement in struggle w Very interesting angle in telling Thuli’s story. At first I had no idea how political active she has been in her youth. I guess it’s the pre-democracy life of any black South African to be always caught in the mix of politics . Seemed her and her brother found politics the only way to make a difference in their communities . Pretty fascinating was her rose to the top office . There, she assumed the role of a real people protector with vigor. It was quite clearly that her involvement in struggle was motivated by the need to make a difference, the need to contribute positively to her people. In her role, she fought greed with all she had, questioned the masters that hired her and rewrote the South African history of hope and belief that all nations regardless of color can work towards a common goal. She led the South African protest for equality and transparency without compromise . Her no pain no gain attitude made her fearless to all the threats and stones thrown to her . I have been so looking forward to reading this book and so far i am disappointed. The author Thandeka literally uses all the words from a theosauris to seem more knowledgeable or literate . The book so far jumps all over the place referencing various other people. 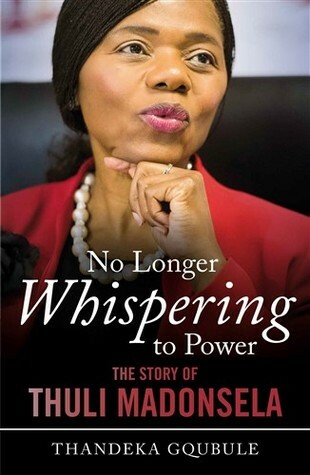 I want to learn about Thuli as she is an amazing woman. I will keep going and hopefully find some substance to the story of Thuli that I so desperately want to know. The writer gives a description of the big cases Thuli tackled. I share her admiration for mrs Madonsela, who has played such an important role in recenst SA political history because of her integrity, which is so rare in politics. However, the author does not to have enough critical distance to her friend, this weakens the book in my opinion. "We step out in hope that a better world is possible because of our love for peace and faith in humanity's capacity to make better choices." Thuli's story has me so inspired. All I want is to live a meaningful life, to use whatever skills I have to contribute to humanity in the best way that I can, and her story is one of encouragement on this journey. A well written review that comes across objective and well researched. Like most South African nonfiction at the moment this is bitter sweet to read as a hero such as Thuli Madonsela (and others) can only exist with villains. I was hoping for more of a biography, though I did learn about some of Madonsela's important work- which I concede represents a big part of what she stands for, and by extension, who she is. I also appreciated learning a little more about the players in the struggle against apartheid. An interesting read. Took a while to get engaged but midway through the book it became hard to put it down.